After his engineering degree at Institut d’Optique and his Master degree at Ecole Polytechnique, Quentin Glorieux went to graduate school at the Paris Diderot University. In 2010, he earned a PhD in Quantum Optics at the laboratory Matériaux et Phénomènes Quantiques under the supervision of Pr Thomas Coudreau. During his PhD, he demonstrated the generation of multispatial mode entangled states using four-wave mixing in hot atomic vapors. In 2010, he joined Paul Lett’s group at NIST in Gaithersburg as a postdoctoral fellow in the Laser Cooling group directed by William Phillips. 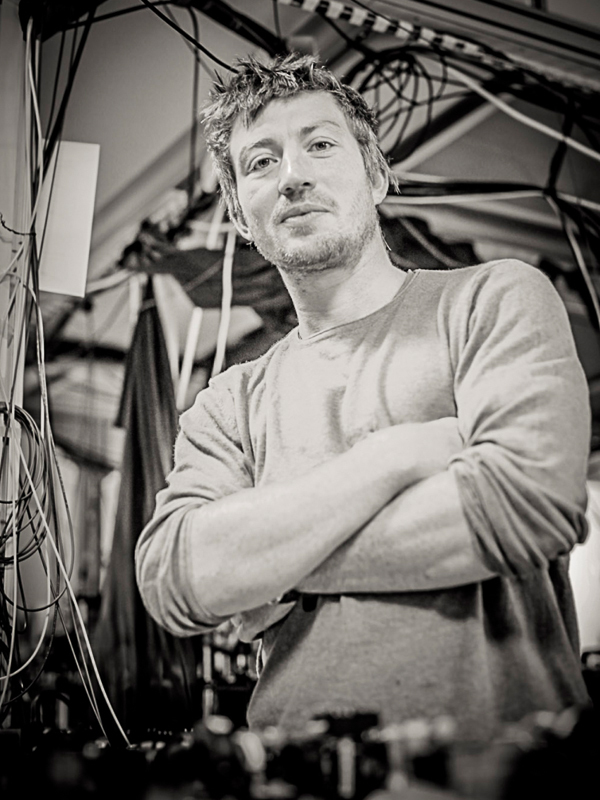 Quentin Glorieux was awarded a Marie Curie European IOF fellowship in 2011 to initiate a project on Multimode Quantum Memories with the NIST, the Australian National University and the group of Nicolas Gisin at University of Geneva. In September 2013, Quentin Glorieux has started a position of Associate Professor at Sorbonne University in Paris as a member of the Laboratoire Kastler Brossel (LKB). He has co-authored 28 publications in international peer reviewed journals (h=14, ~500 citations) and 5 publications in international peer reviewed conference proceedings. In 2018, he has been nominated Junior Fellow at the Institut Universitaire de France (IUF) for a duration of 5 years. Publications List – November 2018. Observation of the Bogoliubov dispersion in a fluid of light, Q. Fontaine, T. Bienaime, S. Pigeon, E. Giacobino, A. Bramati, Q. Glorieux. Physical Review Letters, – Editors’ Suggestion, 121, 183604 , (2018). Vortex Chain in a Resonantly Pumped Polariton Superfluid. T. Boulier, H. Terças, D. D. Solnyshkov, Q. Glorieux, E. Giacobino, G. Malpuech, A. Bramati. Scientific Reports 5, 9230 (2015). Polarization Control of Linear Dipole Radiation Using an Optical Nanofiber. M. Joos, C. Ding, V. Loo, G. Blanquer, E. Giacobino, A. Bramati, V. Krachmalnicoff, Q. Glorieux. Physical Review Applied, 9, 064035 (2018). CdSe/CdS dot–in–rods nanocrystals fast blinking dynamics. M. Manceau, S. Vezzoli, Q. Glorieux, E. Giacobino L. Carbone, M. De Vittorio J- P. Hermier, A. Bramati. ChemPhysChem, 19, 1. (2018). Exciton Fine Structure of CdSe/CdS Nanocrystals Determined by Polarization Microscopy at Room Temperature. S. Vezzoli, M. Manceau, G. Lemenager, Q. Glorieux, E. Giacobino, L. Carbone, M. De Vittorio, A. Bramati. ACS Nano 9, 7992 (2015). Localised excitation of a single photon source by a nanowaveguide. W. Geng, M. Manceau, N, Rahbany, V. Sallet, M. De Vittorio, L. Carbone, Q. Glorieux, A. Bramati, C. Couteau. Scientific Reports 6, 19721 (2015). Storing a short movie in an atomic vapor Q. Glorieux, J. B. Clark, A. M. Marino, Z. Zhou, and P. D. Lett, SPIE Newsroom. (2012). 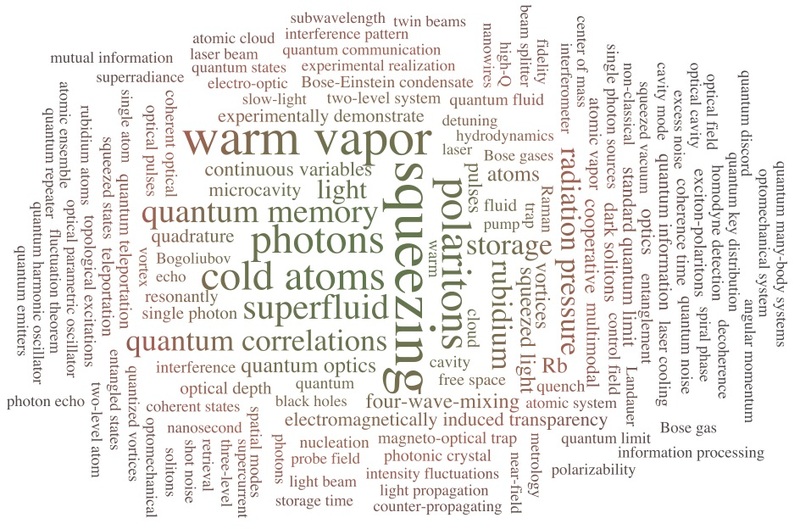 An ultra-high optical depth cold atomic ensemble for quantum memories. BM. Sparkes, J. Bernu, M. Hosseini, J. Geng, Q. Glorieux, PA. Altin, PK. Lam, NP. Robins, BC. Buchler. Journal of Physics, 467 012009 (2013). Quantum Mutual Information of an Entangled State Propagating through a Fast-Light Medium. J.B. Clark, R.T. Glasser, Q. Glorieux, U. Vogl, T. Li, and P. D. Lett, Nature Photonics 8, 515-519 (2014). Advanced Quantum noise correlations. U. Vogl, R.T. Glasser, J.B. Clark, Q. Glorieux, T. Li, N. Corzo-Trejo, and P. D. Lett, New Journal of Physics 16, 013011 (2014).